I would appreciate your input on the background on the RFP being considered at tomorrow's Council meeting. If you don't have time or care to comment, feel free to remove the tag. If there's someone else who may have input, please feel free to invite them to comment. I'd appreciate if the comments could stay connected to the note as I'm heading out soon to watch my nephew play hockey and don't want to miss any. Is there value in soliciting RFPs for the site that don't specify adaptive re-use and considering all proposals at the same time? In particular, I would appreciate input on what I perceive to be conflict with the current Official Plan Amendment being considered by the province. The proposed amendment can be found here, http://bit.ly/StratfordOPMay2014 with the portion on the Cooper Site beginning on page 60. For your convenience I've copied the section below. To consider the recommended provisions for the demolition and adaptive reuse requests for proposal (RFP) for the Cooper site building. Remove cladding, loose material from building, and all outside buildings. These actions will require the City to issue two RFPs, one for the demolition of 45% of the building, and one for marketing the adaptive re-use of the remaining 55% of the building. The City of Stratford invites qualified proponents to submit proposal for the adaptive reuse of the Cooper Building. Public uses are excluded from consideration. Proponents should propose commercial or residential adaptive re-use projects.  Proponents may propose uses for all or part of the building.  Parking requirements and plans will have to be identified for any proposed uses.  If a commercial parking development is proposed for the site, it must be fully financed through user fees.  Commercial uses must comply with the restrictive covenant registered on title.  If commercial uses are proposed, an economic impact study will be required to assess the impact on the City’s downtown core.  Any proposal that is brought forward must include a detailed business plan to be considered by the City.  The City of Stratford reserves the right to peer review your proposal to assess feasibility.  By submitting a proposal, you agree that your proposal can be made public.  There are no municipal guarantees for any proposal or proposed development.  Applicants involved in litigation with the city are excluded from consideration. That the CAO be directed to include these in any invitations issued for the development of this building. The Cooper Site is generally located south of St. Patrick Street, east of Cooper Street, west of Downie Street, north of the railway at the southern periphery of the Downtown Core. The Cooper Site is the original location of the Grand Trunk Railway shops. With April 2014 61 the first building being completed in 1871, the Railway shops (Grand Trunk and later Canadian National) would see numerous expansions over the years and more than 1,500 employees at one time before being sold to the Cooper-Bessemer Corp. in 1963. 1 In 1986 Cooper-Bessemer closed the facility. i) To encourage public and institutional uses which will restore a sense of purpose and vibrancy to the Cooper Site making it a focus of activity in the southern part of the Downtown Core. ii) To ensure that development in the Cooper Site complements and supports the role of the Downtown Core as the primary focus of the City with its own distinct character and identity. ii) To ensure that the historic use of the Cooper Site is appropriately commemorated with an emphasis on the importance of rail to the development of the City. The permitted uses, buildings and structures include any public, institutional or public service facility use, building or structure such as education, recreation, park, public transportation, or government uses, buildings or structures. In addition, accessory and ancillary uses may be permitted, including limited, small scale, ancillary retail and service commercial uses, as well as parking uses, that primarily serve the permitted uses. Council may, by official plan amendment, permit other uses that support or facilitate economic development. The City is in the process of determining the future of the existing structure on the Cooper Site which may include demolition, partial preservation, rehabilitation or commemoration. 4.11.3 Master Plan Process Development of the lands in the Cooper Site – Major Institutional Focus Area designation shall be in accordance with a Master Plan prepared and adopted by the City which will establish the general land use and transportation structure, and provide direction for other related issues such as servicing and urban design.  Allan Pero Question 1: Why is the city proposing undertaking the responsibility/cost of partial demolition prior to finding out if a developer might wish to retain at least some portion of the west end of the building? Question 2: What evidence is there (produced by structural engineers or architects) that the proposed substantive demolition will not compromise the integrity of the rest of the building?  Jason Dietrich Question 2a: what evidence or research findings, from qualified persons, is there to justify this percentage of the building being demolished? Why this amount? Why not another amount? Why not show your work on this? Is there any? Was it fully arbitrary. And if so, why? Why not go with a trained professional's opinion?  Kel Pero Question--to me, before almost any other question: Why, if I understand this correctly, is there no process in place--involving City Hall staff first, and THEN Council--for structuring the process of re/development of municipal lands? There should be at least a partial boilerplate process that outlines the steps one must take before ANYTHING is done. This is COMPLETELY ASIDE, I must emphasise, from ANY historical/heritage value the site has, from any interest groups, etc. WHY does there seem to be no structure here? Stratford is not some berg in an undemocratic, undeveloped country; it's a modern city, and has been for some time. I am completely at a loss to understand what I gather is the lack of this first, most basic step.  Kathy Vassilakos At the last meeting we took the different parts of the compromise proposal separately and amended the retention part of the proposal to be approximately 75000 sq ft based on engineering determination of where the removal needs to be for structural stability and security . page 27 of the minutes. this was to address questions around structural stability of the remaining structure and ability to secure the building from tresspassing.  Jason Dietrich Could someone please post the minutes here? I'm having technical difficulties.  Bruce Whitaker MARKETING!!! We need someone who can write an appealing brief on the opportunity that exists - focusing on the magical history of the place and of the redeeming features of the building. I would also suggest that we sell Stratford as part of the RFP - including its geographical reach of over 10 million people within two hours. How many tourists do we attract to Stratford each year? There are so many positives to it. As is, the RFP is bland and definitely not a marketing piece - rather it seems more focused on cost than potential revenue - was it written by an accountant or admin? Let's think creatively. Let's develop an interesting narrative/story around it that would be an appealing piece for newspapers and online media spots to pick up thus creating the potential for demand - getting the word out there to everyone rather than a chosen few. May want to connect with David R Hicks and others from Stratford's creative set. My next question would be who is the RFP being sent to (local, Canada wide, international)?  Katharine Bee I agree - I don't have much retail or sales experience but I have found that what is being sold is seldom just the product or service - it is the attached STORY that is being sold!  Bruce Whitaker As part of the adaptive reuse portion, I would make mention that the City of Stratford is willing to work with a developer to ensure a suitably sized building.  Lesley Walker-Fitzpatrick instead of any demo before development!  Jason Dietrich Q: If the scope of the demolition is to be determined based upon a structural engineer's assessment, how is it possible to submit an RFP for either demolition or development? How the hell do you tender an open-ended RFP? What numbers does one use? I don't see it stated clearly in the minutes. (I don't see anything stated clearly in the minutes for that matter.) What is the order of operations here??? How can an RFP be voted on when there is no P in RFP yet?  Michael Wilson  The demolition proposed destroys the integrity of the object and its future to sustain a new life, it is a desperate move, arbitrary and dubious at best. All elements proposed, in the City's proposal, are in direct opposition of the intention OFFICIAL PLAN. Residential is the least attractive and viable use, public use being an exclusion in the RFP? Haste makes waste, and that is all that all remain, toxic at that...... not to mention the unknown, undetermined environmental clean up costs once the building is destroyed...... please help Council.  Jason Dietrich Here's the problem with that, Bruce: what if they want more than 75k sf? What if they want less? What are the limits? What if the engineer's report says 85 or 90% is structurally sound and viable? What if they say 49? Or 25? That would be in direction opposition to the vote last meeting. What trumps what? We have ZERO direction here. Yet council is still forging blindly ahead with utterly meaningless, and ultimately toothless motions. It's truly mind-boggling. Talking heads. Blind leading the blind. And the blind willingly following right off the bloody cliff. Well, 89.1% of them.  Jason Dietrich I completely agree Bruce. This is the crux of the muddle here; it's already been decided! It's too late for that reasoned, sensible collaboration, if we are to go by council's actions. They've put forth a vote to say, "Who wants to build me a house? What's that? How big, you say? I have no idea. But how much will it cost?"  Kel Pero Frankly, I think we're up to our neck in appealing narratives. Everyone knows the place is historically significant. That really doesn't mean much of anything if we have no way of going about assessing and costing anything--anything--that is done to the place. Dreaming of what it might be is about five steps ahead of where we actually need to be right now if anything is going to be done.  Kel Pero  Councilor Vassilakos or Councilor McManus, is the original report/recommendation from the engineer available? Also, more to the point, who's going to pay for this? Where is--again--the PROCESS by which things are assessed and costed? Why would the city (i.e. the citizen of Stratford) pay to demolish part of the building and then, presumably, pay again to have it redeveloped? I've only been in Stratford three-and-a-half years, and even I know that, pardon me, but we've all heard well-intentioned proposals for what the site could and should be till we're blue in the face. If there's no way of assessing and costing any of it, we might as well be talking about relocating our town to Mars. Where is the reasonably transparent, this-is-how-it's done method here? Whose interests are served by the current proposed plan of action (and yes, I mean "interests are served" in both benign and malign ways)? Why is this all so half-assed? I mean that sincerely. Kerry McManus Kel Pero - you can access the latest RJC report in the additional documents from the May 26th meeting. Lesley Walker-Fitzpatrick yes - whose interests are being served?????  Jason Dietrich THANK YOU, Michael Wilson.  Kel Pero PS It's great that Chantelle can find all kinds of how-tos for what we're talking about, but we're not employees of the City of Stratford. Some full-time salaried employees of City Hall, including CAO Ron Shaw, presumably have it within their job descriptions to research and prepare the information that is needed to follow proper process. And that info is presumably NOT to be presented to councillors mere HOURS before a vote.  Jason Dietrich Yes indeed Kel; is there a codified SOP for development? If not, why the hell not?  Kerry McManus I am just leaving my nephew's hockey game to go celebrate a recent engagement with friends. Reviewing events called "Council Meeting" should help you find all the related documents.  Kerry McManus Also my website kerrymcmanus.com and notes on my FB wall could be helpful too.  Kel Pero Thanks, Kerry.  Jason Dietrich Right. With Kerry's permission, I'd like to request that everyone tagged, or anyone that reads this share it. At least once. Let's invite intelligence and rationale to this discussion. I would also suggest by-lining this with something along the lines of making it clear that this is NOT a debate on demo V saving; this is a forum for asking questions on the process. A process that is as yet wholly nonexistent.  Kerry McManus Thanks for all your efforts to solicit input from a diverse group of stakeholders.  Kel Pero I heartily endorse Jason's suggestion. (I removed the tags for the website post just to help those trying to follow a Facebook thread on a website.) -Hi All. If you have time would appreciate it you would read through this thread and comment. You represent a range of expertise and experiences on policy and development in different parts of Ontario and Canada. If you have time, great, if not, thanks for being someone I thought would help if you could! 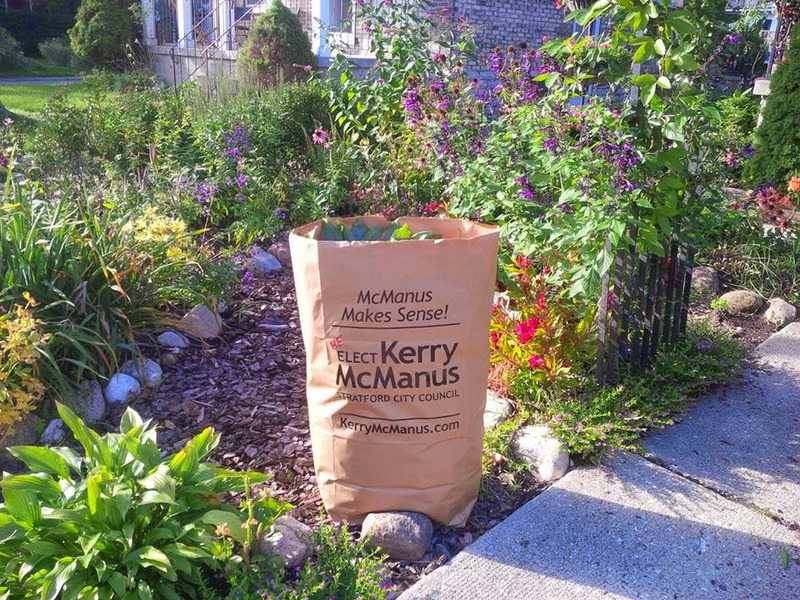  Kerry McManus Geoff - I find the recommendation to preclude public uses and encourage commercial and residential uses curious. Our Official Plan Amendment was passed last spring. There are often empty stores in the core -what would adding a significant amount of commercial do to help/hinder the core? And finally, the distance from a railway to residential is to be 75m for new development. Anyone able to help bring clarity to what I see as conflicts in the reports?  Kel Pero Again, Lesley--that's what pretty much everyone thinks. The problem is that we have no way to get there. Or anywhere. Decisions are being made with no structure, and certainly no idea of how they'll be paid for. We need to pull 'way back. Jason Dietrich Mixed public and commercial use. Spaces made-to-order, with long-term lease agreements with the city. Ensuring as well that x amount is reserved for public use. Commercial space in amongst a hub of daily public activity would be about as prime as it gets.